Changes to market conditions mean that the pharmaceutical industry is turning to Russia; Igor Stefanov for Synergy Research Group analyses the untapped potential. Igor Stefanov is Director for Business Development for Synergy Research Group (SynRG™), a Russian CRO. Prior to joining SynRG in January 2007, Igor was Managing Director of Smartlock, a Russian biometric company, and was recognised as Entrepreneur of the Month by the Russian edition of Forbes in May 2005. With an MBA in Economics and strong local expertise, Igor has been providing business consulting services to large multinational companies including Pfizer, J&J, GlaxoSmithKline and F.Hoffmann-La Roche in Russia since 1993. The global pharmaceutical market is projected to double over the next 13 years, rising to a value $1.3 trillion. Around 19 per cent of the sales are expected to come from E7 countries - Russia, India, China, Brazil, Indonesia, Turkey and Mexico (1). Yet the biopharmaceutical industry will find it hard to capitalise on these opportunities unless pharmaceutical companies change their business models to comply with the new market conditions. In the first place, this is true for R&D, including clinical trials. The report says that R&D effectiveness has decreased by 50 per cent during the past 10 years. Thus, in 2006 the US Food and Drug Administration (FDA) approved 22 new molecular entities (NMEs) with the total R&D budget of about $55.2 billion, compared to 53 NMEs in 1996, when R&D expenditure was less than half the sum it is now. In 2007, the situation is even worse - only seven of the FDA's 37 new drug approvals during the first six months of the year were NMEs (2) - that is, over 80 per cent of so-called 'new drugs' are actually new dosage, indication, or a combination of already registered drugs. There is nothing surprising in this situation; pharmaceutical companies prefer to minimise the risks and cut R&D expenses. After all, they are profit-driven organisations aiming to earn money for their shareholders -according to PricewaterhouseCoopers, the average R&D spending in the corporate budget within the industry rose from 15 to 17.5 per cent during the past 10 years, while sales and marketing expenses rose from 28.7 to 33.1 per cent. It might seem that, under these circumstances, the emerging markets with their traditionally high patient recruitment rates and the relatively low cost of conducting clinical trials should become a panacea, or at least a blockbuster for big pharma itself. Not so! Currently, the total share of E7 countries in global clinical trials market accounts to six per cent in the total number of studies, or 1,256 versus 18,756 (3), while they comprise 48 per cent of the world population, or 3.2 of 6.6 billion people (4). Russia, with it's 142.2 million population and 274 ongoing international multicentre clinical trials, ranks as number one among the E7 countries in this regard. At the same time, the US, with a population of 301.1 million, is currently accommodating 10,966 clinical trials. Assuming that the US clinical trials potential is capitalised at 100 per cent, Russia's resources are currently being used at only five per cent. Evidently, the so-called emerging market doesn't look like a mountain stream, it reminds one more of a dismal creek cutting its way through the bushes of legislation and boulders of prejudice. Leaving aside poetic allegories, the key question to answer is: Why doesn't pharma use this tremendous and almost untapped opportunity in full? Let's take a look at three key efficiency factors of every clinical trial: patient recruitment rate, data quality, and cost. It is well known that Russia is one of the world leaders in patient enrolment - the average patient recruitment rate in 2006 exceeded 4.7 patients per site per month. For some nosologies the figure is 10 times higher than in Western Europe and the US. For hypertension, this ratio equates to 10.2 - about 5.4 for asthma, 4.6 for rheumatoid arthritis, and 3.3 patients per site per month for breast cancer (5). As of 31st May 2007, there were 768 investigative centres in Russia registered by the Federal Service for Healthcare and Social Development in the Russian Federation (RosZdravNadzor, RZN) for conducting clinical trials. Most of them are located in big industrial cities, in the capitals of Federal Districts with populations of more than one million people. The top five cities with the largest number of investigative sites are shown in Table 1 (see page 44). However, there is another side to the story - as the number of clinical trials in Russia increases, the number of concurrent trials conducted at one particular investigative site grows even faster. At present, the number of concurrent studies conducted by one investigator in the same nosology can mount up to 10. As a result, all three efficiency factors suffer. First, the patient recruitment rate falls. Secondly, the data quality decreases, because investigators are sometimes physically unable to pay adequate attention to every trial conducted at the site. Finally, investigators need to be financially motivated enough to rectify these two problems. Unfortunately, most CROs, as well as sponsors, prefer to keep to the beaten tracks rather than develop new sites in the Russian regions. Despite the Ministry of Health's efforts to maintain a balance between the number of healthcare institutions and the population in the Federal Districts, a per capita number of sites ratio in some regions is far behind the Central Federal District (see Figure 1). It's a catch-22 situation: on the one hand, sponsors do not allocate new trials at inexperienced sites; and on the other hand, sites cannot get study experience if sponsors do not involve them in new studies. It would appear that the 'cream skimming' period for the Russian clinical trials market is over, and all interested parties, notably sponsors and CROs, should use more serious and professional business models for further regional market development and its effective deployment. Today, there are three types of quality control for clinical trials in Russia: sponsor audits, FDA inspections and RZN inspections. Of course, clinical trials professionals are well aware what a sponsor audit is, but it is worth mentioning that from January 2004 to July 2007 there were 1,003 clinical trials conducted in Russia. Since 2004, RZN inspectors conducted 88 scheduled audits in Russian investigative sites. The goal of such an inspection is to make sure the site activities related to clinical trials comply with the current Russian legislation and good clinical practice (GCP). As a rule, the list of sites to be audited is officially published on the RZN website (6) six months prior to the date of inspection. General information - study drug name, study protocol number and name. The legal basis of the clinical trial - RZN approval, contracts with a sponsor and CRO, insurance contract access to the study drugs, dispatch procedures and expiration dates. Activity of the local ethics committee - inspectors examine the staff including the chairman, secretary, a number of members, sexual composition, presence of independent members, as well as staff turnover. IRB SOPs are checked - the frequency of the meetings, procedures of examining the clinical trials materials (primary and secondary) and safety data, as well as the procedure of examining deviations from the protocol. The minutes of IRB meetings are then enclosed in the final report. At the completion of the inspection, the commission prepares the report. If any shortcomings are revealed during the audit, the commission describes them in detail and make proposals for their elimination. The report needs to be signed by RZN inspectors, as well as site representatives, including PI, to be delivered to RZN within 10 days. The key goal of such inspections is to make sure that the data obtained from the site during the clinical trial is reliable and based on available source documents. There are two types of inspections: study-oriented and investigator-oriented. All FDA inspections in Russia belong to the first type. The date of the FDA inspector's visit is agreed upon with the principal investigator in advance (as a rule, two to three months before the visit) after which the site obtains an official notification about the date of the inspector's visit. During the audit, the FDA inspector is entitled to gain access to any medical documents related to the clinical trial. The FDA has been carrying out inspections of study centres in Russia since 1995, when NN Petrov Institute of Oncology in St Petersburg obtained a positive result (voluntary action indicated (VAI)) - that is, objectionable conditions were found, but the problems did not justify further regulatory action. Any corrective action was left to the investigator to take voluntarily. The FDA has carried out 36 audits (7) of the activities of Russian clinical study centres since 1995, and no shortcomings has been discovered in 50 per cent of cases (no action indicated (NAI)). Seventeen audits resulted in a positive grade (VAI), and only in one case was a negative grade obtained (official action indicated (OAI)) when regulatory and/or administrative sanctions by FDA are indicated (see Figure 2). For comparison, in the US the indices are 19 per cent, 75 per cent and six per cent, respectively. The geography of inspections conducted by the FDA in Russia is mainly limited to Moscow and St Petersburg; 16 inspections were conducted in St Petersburg, 12 in Moscow, two in Smolensk and one inspection in Kemerovo, Arkhangelsk, Tomsk, Voronezh and Yaroslavl. The growth in the number of FDA inspections in Russia since 1995 is shown in Figure 3. The FDA has conducted a total of 1,356 inspections of study centres outside of the US since 1980 (around 10 per cent of the number of inspections conducted in the US for the same period). Of 18 deficiency cases, 11 were related to inadequate and incorrect records, seven failures to adhere to protocol were registered; and two failures to report adverse reactions. There were also two cases of inadequate drug accountability, one case of problems with the availability of records and one inadequate patient consent form. The nature of the observations made by the FDA inspectors with regard to Russian investigative sites is illustrated in Figure 4 (see page 48). Russia ranks as number one in terms of the quality of trial-related activities amongst other E7 countries. Fourteen inspections were carried out in Mexico including five cases resulting in OAI, eight cases gaining the VAI grade, and only one case in which no shortcomings were revealed. All seven inspections in China resulted in VAI and four out of six Indian centres received the VIA grade as well as gaining two NAI classifications. According to the data provided by Parexel analytics the average cost per patient in Eastern Europe is 28 per cent lower than in Western Europe, and 47 per cent lower than in the UK (8). According to Cutting Edge Information, the average cost per patient for Phase III clinical trials exceeds $26,000 (9). Running a Phase III trial with 300 patients enrolled in Russia could therefore save companies up to $4,134,000 in direct costs, plus faster patient enrolment could generate savings of a few million per day in early product launch. According to the survey of 200,000 clinical trial contracts prepared by Hovde Associates LLC in 2004, the external costs in clinical trials are allocated in the following way: 33 per cent goes to investigators, five per cent are lab costs, and the remaining 62 per cent are CRO fees (10). Let's take a closer look at each of these in Russia, and how they vary from their international counterparts. Due to substantially lower salaries, Russian investigators' hourly rates are lower than those payable to their European or US colleagues. In spite of this, for ethical reasons some pharmaceutical companies and global CROs believe that investigator fees in international multicentre clinical trials should be equal across all countries. We shall consider, therefore, an investigator's fee in Russia to be equal to an international one, and will exclude it from examination. Some sponsors do not trust Russian labs, preferring to use central laboratories located elsewhere. This substantially increases the cost of trials, due to both transportation expenses and lab fees. Table 2 provides a comparative analysis of Russian and foreign lab fees. It follows, as shown by the table, that some of the tests performed by Russian labs are five times - and in some cases up to eight times - less expensive on average than those performed by foreign labs. Russian labs, as well as Russian sites, have been taking part in international multicentre studies since 1989. They have almost 20 years' experience in performing tests for clinical trials. At present, they have everything necessary at their disposal, including equipment, standard operational procedures, qualified personnel and international certificates. They can conduct up to 750 different tests, including the most complicated ones. Moreover, the labs render a broad range of value-added services - from project management to data archiving. Naturally, before taking the decision to employ a local lab, the sponsor must ascertain professional compliance with the complexity of the trial, personnel qualifications and necessary equipment, as well as the availability of standard operational procedures and quality assurance. For this purpose, it is recommended to visit several selected labs before launching the trial, and to conduct it through a sponsor's, or an independent, audit. At present there are about 55 CROs in Russia. They accounted for 41 per cent of the total number of clinical trials approved in 2006. More than 50 per cent fall on the G6: Quintiles, Parexel, ICON, P.S.I., ClinStar Europe and Evidence. The first three are well known global companies, and the latter three are international CROs specialising in conducting clinical trials in Russia and Eastern Europe. It is well known that the high level of business process standardisation is one of the key advantages of global CROs. However, while this is a benefit in the case of SOPs, it is not entirely true in terms of the standard hourly rates for the services of CROs in Russia and, for example, the US. A comparative analysis of local and international CROs hourly rates is given in Table 3, see page 50 (we consider the local CROs are those with 100 per cent Russian capital). Table 3 demonstrates local CRO services cost four times less on Russia and Eastern Europe average – and in some cases up to seven – than those provided by the local staff of international CROs and more than five times – and up to nine times – less expensive than those provided by international staff. Be that as it may, it is worth mentioning that both local and international CROs employ the same target audience and recruiting agencies. Most applicants have excellent medical education and have completed residency training or postgraduate study; work experience as a co-investigator is also desirable. If an applicant has no work experience, he or she is first of all sent to GCP training courses. At the same time, the number of high-quality courses is relatively small. Therefore, the local CRO staff are often trained along with the personnel from global CROs or international pharmaceutical companies. The training process then continues within the respective companies. At the same time, local companies adopt foreign experience and implement ongoing online training programmes for their employees, involving regular tests and certification. In addition to professional training, there are English courses in many local CROs, and fluency in English at the Solid Intermediate Level as a minimum is a compulsory requirement. Currently the clinical trial application process is quite straightforward. According to the Title 37 Part 2 of the Federal Law ‘On Medicines’ four documents should be submitted to RZN: a letter of application; a positive conclusion of the National Ethics Committee (NEC); a preclinical study final report and a drug information leaflet. Though all documents should be translated into Russian, in case of uncertainty the experts refer to the original language of the document. If the application is submitted by the CRO on behalf of a sponsor, the properly notarised power of attorney should be attached. The approval usually then takes eight to 12 weeks. Russia still ranks number one among E7 countries in terms of the number of clinical trials – the RZN approved 1,003 international clinical trials from January 2004 to July 2007. Nevertheless, as discussed, only five per cent of the potential of the clinical trials market is currently employed. In spite of the heterogeneous geography of the investigational sites, the average patient enrolment rates by the main nosologies are 10 times higher than in the US and Europe. At the same time, the quality of the data obtained remains high. This is supported by the positive results obtained from 124 inspections conducted by the FDA and RZN at Russian sites. The local resources (labs and CROs) also comply with the international quality standards in full. If sponsors employ them, it will be possible to reduce clinical trial expenditure by up to 50 per cent. 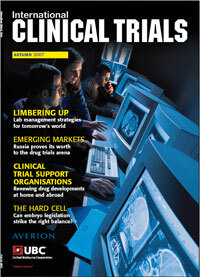 In the clinical trials arena, Russia remains one of the most attractive global markets. To optimise this potential, it is undeniably necessary to employ local resources.